The powerful legacy of young people putting their own lives in the way of injustice once again rises to the front of American culture. And so it should. More power to them. We have failed them. Adults have shown ourselves to be inadequate in understanding the world we have forced onto our children and students. This week is a sobering reminder to us that adults so easily become inured to injustice, carry on as if true change is impossible, and as a result, allow travesties to continue – with young people the most harmed victims. Adults continue to elect representatives that do nothing to protect human lives from vast and destructive gun violence. Adults bemoan massacres and then do nothing. But as singer-songwriter, Dar Williams reminds us: Teenagers kick our butts. And they’re kicking our butts once again. I have never been more proud to be a high school teacher than this week. As far as I am concerned every high school student who spends their time organizing, lobbying, protesting, and defending their own lives should not have to crack another book and should get straight A’s the rest of this year. And SHAME on us that they are now compelled to do this. I will leave it to my colleagues to discuss the tragedy of what the teaching profession has now become: having to make the choice that you will sacrifice your life to gun violence to save the lives of your students. Here, I want to acknowledge the power of young people and why THIS will be the turning point for the debate around gun violence in our country. The students of Marjorie Stoneman Douglas High School in Parkland, Florida have been forced into the cruelest fraternity in our country: gun violence survivors. Acknowledging their own terror, grief, fear, and pain, they have taken to the streets and the statehouses. The undeniable power of their voices and their stories have galvanized their compatriots across the country. There is nothing more persistent than a determined teenager. They are channeling their anger into a thoughtful, meaningful, and powerful movement. As a high school teacher I know what we adults must do: join them, but let them lead. 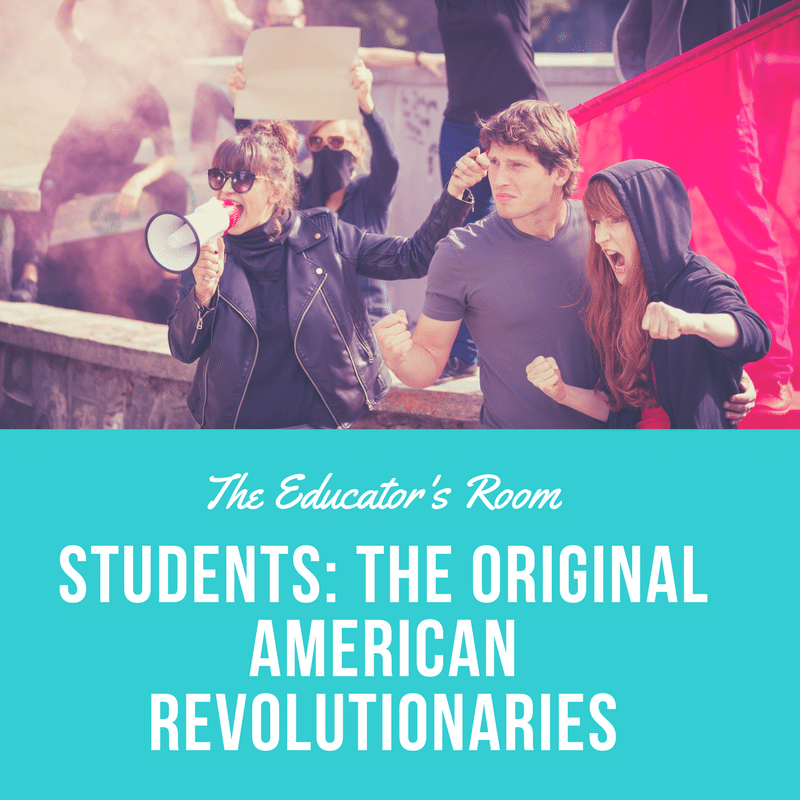 Though it has always been my favorite thing to teach, we American adults don’t often acknowledge the role students and young people have played in the historical changes towards justice in this country. In fact, it was a group of students at King’s College in New York, calling themselves the Sons of Liberty, gathered quite a while ago to flout what they believed to be unjust laws. Those laws were part of the Stamp Act, imposed by Britain on young American colonies in 1773. That group of students included 19-year old Alexander Hamilton, who caught crowds on fire with his energetic oratory that called for colonial unity against the British. Otherwise, he declared, “fraud, power, and the most odious oppression will rise triumphant over right, justice, social happiness, and freedom.” The very ideas on which we framed our government were perpetrated by young people of the time who knew they would no longer put up with a culture they knew would demean them and keep them unfree. In the 20th century, young people led the way in desegregation, education, and voting rights often at the cost of their own lives. Addie Mae Collins (14 years old), Cynthia Wesley (14 years old), Carole Robertson (14 years old), and Carole Denise McNair (11 years old) were killed when white supremacist terrorist members of the KKK bombed the 16th Street Baptist Church in Birmingham, Alabama in 1963. James Chaney (21 years old), Andrew Goodman (20 years old), and Michael Schwerner (24 years old) were violently killed trying to register African Americans to vote in Mississippi in 1964. Jeffrey Miller (20 years old), Allison Krause (19 years old), William Schroeder (19 years old), and Sandra Scheurer (20 years old) were killed at Kent State University in 1970 because they were attending or near students protesting the bombing of Cambodians in an expansion of the war in Vietnam (14 other students were shot and injured). Only eleven days later, Phillip Gibbs (21 years old) and James Green (17 years old) were shot and killed at Jackson State University during a similar student protest. These students were killed because of movements that disrupted the comfortable existence the adults around them. Hundreds of more young people have been killed simply for existing, for being people of color, for merely upsetting adults or other young people who had obtained weapons of horrifying destruction. And then there are the students who have been killed or injured just because they were in the wrong classroom or school hallway at the wrong time. Nineteen years ago, we were shocked when 13 students and a teacher were killed and 21 more injured at Columbine High School by high capacity guns that young men were easily able to obtain. Nineteen years ago. Two decades. In the wake of that event, HUNDREDS of students have been shot while at school. Tiny kids – 6 and 7 years old at Sandy Hook Elementary, middle schoolers in Lake Moses, WA, and college students at Virginia Tech and Northern Illinois University. And so many high school students. Even children ages 6-13 were not safe in an Amish school in Lancaster, PA. I grew up afraid of nuclear annihilation, made worse by the Cold War drills we had to do during my years of elementary and middle school. But a nuclear war was always a far-off possibility, and we had no evidence it would actually happen. Now students must constantly drill to defend themselves from an “active shooter scenario” in their school, and they have plenty of evidence that it CAN happen to them. For so many, it HAS happened to them, their siblings, their friends. Many past victims have tried to speak out – after Columbine, after Virginia Tech, after the tears of the parents of the students murdered atSandy Hook. But now I sense a sea-change. Because teenagers kick our butts. They have always had a keen sense of justice because they are so often on the receiving end of injustice. Twenty-first-century teenagers know how to use the tools of their generation to organize, use their voices, and make change. And as always, they face resistance from uncomfortable adults. The accusation that they cannot think for themselves and that gatherings of students are “actors” is an old calculation of conservative adults trying to resist change. The nine students who braved virulent attacks, threats, and terrible abuse just to get an equal education in Little Rock, Arkansas were also accused of being actors. The students from Parkland, Florida are experiencing the same resistance only days after the massacre in which they lost their friends and teachers. But they are real and they know what they are doing. They understand the odds, they have calculated the risk, and yet they have decided to do it. They are going to make a change with or without adult support. This teacher is going to follow their lead. Because I know: teenagers kick our butts. And our butts need kicking.